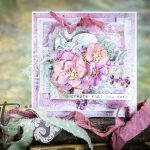 Tina here today to share with you a fun technique and project using the Birds and Butterflies die set. I just love the variety of dies you get in this set!! While these dies have been create for the Sapphire machine, they will work fabulously in the Grand Calibur as well, which is what I have used today. We will be creating a fun water-colour look to our butterflies and stitching them to our page! Cut/emboss all 4 butterflies from the PHS-506 Birds and Butterflies die set onto water-colour paper twice. This will give you 8 butterflies. You can cut more if desired. Color Gelato’s onto Craft Mat. Spritz with water. Using paintbrush, colour butterflies using this water-colour. Color each butterfly slightly different. Allow to dry. Color Gelato’s again onto craft mat and spritz with water. (Do one color at a time so you have more control of the colours.) Press background patterned paper into this wash to add a light water-colour look to your page. Repeat with various colours until you achieve the desired look. Open bottle of irRESISTible texture spray and drop colour onto page. Allow to dry. Add small amount of adhesive runner to the centre portion of the dry butterflies. Layer some together if desired. Add to page as seen. Use machine to stitch the butterflies in place, only stitching the “body” of the butterflies. Lift wings of sewn butterflies to give depth. Trim Patterned papers to layer under photo’s. Lightly distress the edges. Staple together and adhere to page, allowing some areas to go under the butterfly wings. Add cardboard under small square photo’s and adhere to page to give depth. 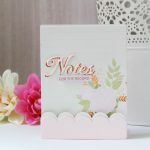 Add stickers, title and journaling as desired. This fun technique can be applied to the birds as well as the butterflies in this set. 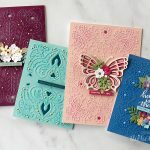 These can be used on cards, mixed media, anything you can imagine!